CRESTVIEW — With the signing of Bill 7055 in March, Gov. Rick Scott made first aid training for Florida students part of state law. The AED is a device that can check a person’s heartbeat and shock the heart back into a normal rhythm when it stops functioning, according to the American Heart Association’s website, www.heart.org. The device also provides guided instruction on its use. Dexter Day, Crestview High School principal, said CHS students currently have the option of taking CPR classes as one of their electives, after which they are CPR certified. The Simas, Stacey and Shawn, and their two children, Lexi and Carter, are among people who have worked to get the bill passed over the last two years. They became involved in the legislative side of things two years ago when Lexi, then 16, had a cardiac arrest — meaning her heart malfunctioned and stopped beating —while running on a treadmill at a Viera gym. Because the people at the gym knew CPR and used an AED, they were able to resuscitate Lexi until paramedics arrived. “As we stood over Lexi as she laid in the emergency room, we didn’t know if she would live or die. The helpless feeling you have as a parent is indescribable,” her dad, Shawn, said in a previous News Bulletin interview. “Lexi never had really any health problems. She had been an athlete since 4 years old. She started playing T-ball and soccer when we lived in Crestview. Sudden cardiac arrest struck our family out of nowhere ... I made a promise to God that we would pay this forward if he gave her another chance and he did. The Lord has worked this out for our good and the good of others,” Shawn said. Lexi spent three weeks in the hospital. Doctors implanted a cardiac defibrillator in her chest that has to be checked by a cardiologist every three months, but they cleared her to return to school and all activities except contact sports. 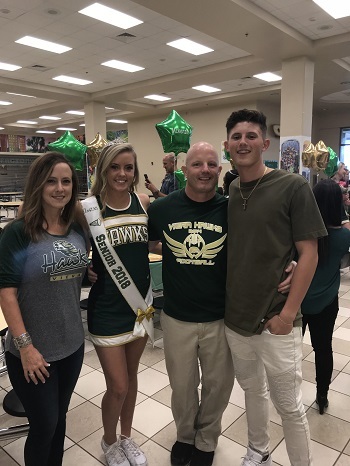 She finished her junior and senior years as a varsity cheerleader at Viera High School. Along the way, she and her father requested that the Brevard County school board pass legislation for her fellow high school students to take CPR training, which they did Nov. 21. Previous efforts to get Senate and House CPR bills passed in Florida failed. “It was called an unfunded mandate, meaning the state did not want to mandate this training without the funds,” Shawn Sima said in a previous interview. “Essentially the cost should not be an issue at all. Most of the CPR kits are donated. We could honestly set up a Go Fund Me and have the money. We are actually working with the American Heart Association to possibly set up an area for donation in the state of Florida,” he said.